Things to know about the file format can be found at the 'File formats' on'Line objects', 'Polygon objects' and 'Label objects'. In the 'how to' creation of objects like 'Line objects', 'Polygon objects' and 'Label objects' is described. The file menu handles the object files. It also selects the type of operation in witch the object editor will operate: Handle line objects or handle label objects. Loads a object file and switches to the required mode. Saves the current file. For information on the file name look at 'How to > Work with objects' on how to name them properly. Draws the edited object on the current map window. 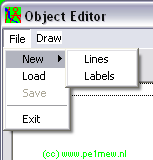 The object editor can work in 2 modes: Label editor and Line editor. Appears with the click of the mouse on the postion where a object is placed and can be manually changed. Appears with the click of the mouse on the position where a object is placed and can be manually changed. Text that should be placed at the label. 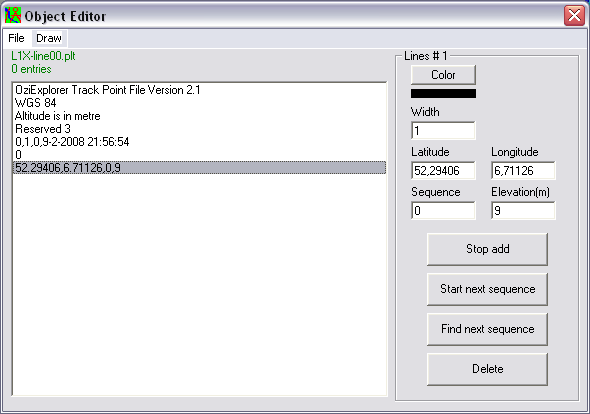 Sets the position of the label around the coordinate. 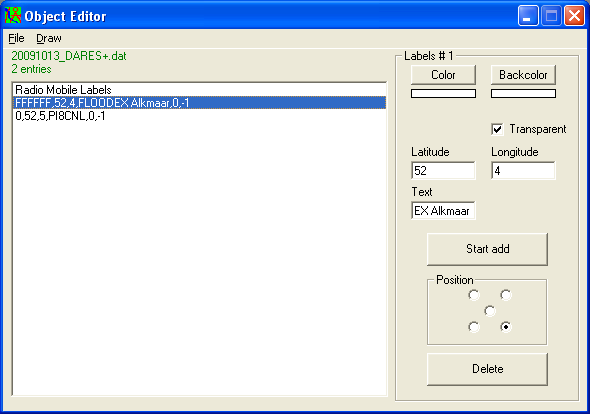 Sets the position of the label with respect to the exact coordinate of the label. A line object file can hold more than one line. Each line is formed in a sequence. Here the secence is displayed.